Our Special Moments Event Planning team became way more than “Month of Coordinators” for Brittany and Troy when Hurricane Michael threatened their Clearwater Beach Wedding. Tammy and Shauna become more than ‘month of coordinators” and more like family. I booked them about 6 months in advance for a destination wedding. They made everything flows seamlessly and was very honest since I was a little stressed coming from out of state in the midst of a hurricane ( Michael). They gave me ideas and direction when needed and also paid very close attention to intricate details. They are amazing!!!!! Brittany and Troy first met at an Army training event and the conversation eventually moved from military skills to their love of family, food and their future aspirations. And the rest, as they say, is history. 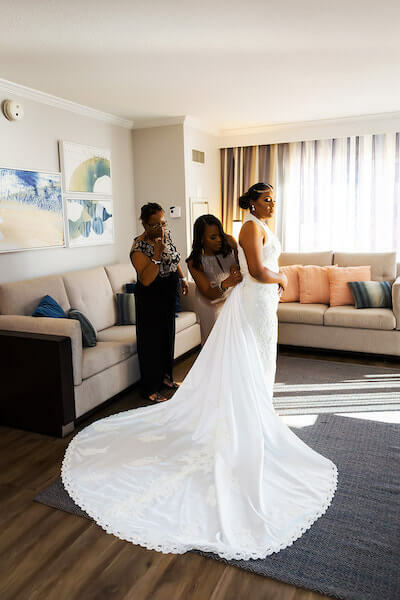 They have both been visiting Florida for years and the Hyatt Regency Clearwater Beach Spa and Resort was the perfect location for the wedding and their out of town guests to enjoy the warm weather and tropical vibe. Guest enjoying this Gulf Coast wedding were welcomed in royal style with welcome bags and fun personalized sunglasses for the rooftop wedding ceremony. Brittany looked like a Queen in her elegant lace applique, halter top gown. The beading and complimenting blusher added a royal touch. Her second gown of the evening was an absolute showstopper. Troy selected a brilliant royal blue tuxedo with black trim and bow tie that paired with the incredible royal blue, black and gold color theme of the wedding. After exchanging their wedding vows the couple took some time for some magical photos and to enjoy the Clearwater beach Sunset. Then it was time for a gown change by Brittany before their wedding reception. The beautiful royal blue, gold and black décor were accented with brightly colored traditional African cloths. The loveseat at Brittany and Troy’s sweetheart table was truly fit for a King and his Queen. Guests enjoyed a fun tropical signature cocktail, a caricaturist and the couple jumped in as guest DJ for a while. The fun cake topper reflected how the couple met at a military event as well as a little touch of bling. This wedding truly reflected this awesome couple. We loved every minute of working with them. Tammy and Shauna are very detailed oriented and will ensure that your vision comes true on your special day. They are very professional, honest, and truly care about your total experience. I would advise anyone to use them not only for wedding planning but for any event such as baby showers or vows renewals. I would choose special moments event planning again. We wish Brittany and Troy a lifetime of happiness! Thank you to all of the vendors who brought their dream wedding to life.